James Dietz Artist Proof Limited Edition Print:"You Have Your Orders"
About the Art: At approximately 2105 hours on 7 November 1942, the first of 39 C-47s took to the air carrying 2nd Battalion, 509th Parachute Infantry into the history books by being the first U.S. Army Airborne Battalion to jump into combat. Before the first paratrooper exited the door, the Battalion would fly more than 1600 miles from England to North Africa, completing the longest airborne invasion ever attempted. The capture of two Algerian airfields, La Senia and Tafaroui, during OPERATION TORCH, the Allied invasion of North Africa, was a critical supporting role for the beach landings. Significantly, both airfields were beyond the operational reach of the initial beach forces. The capture of the two airfields was critical to the Center Task Force's invasion plan that was aimed at the port town of Oran. If the airfields were left un-checked, enemy aircraft would have had the freedom to attrit the exposed invasion forces. Eisenhower's Allied Force Headquarters had two plans for the invasion due to their lack of knowledge on the extent of the French resistance in North Africa. The War Plan would be enacted if the French decided to fight and the Peace Plan would be initiated if the French accepted the Allies as comrades in arms. LTC Edson D. Raff, the 509th Battalion Commander, also proposed two plans based on the French resistance. If the Peace Plan was in effect, he would air land his Battalion at the airfield at La Senia. If the War Plan was in effect, he would conduct a mass tactical parachute jump between La Senia and Tafaraoui airfields followed by a simultaneous seizure of each. One company was assigned the mission to attack La Senia and the remainder of the Battalion would attack Tafaraoui. The day prior to the Battalion's departure, LTC Raff spoke to the Battalion in mass for the last time. Unsure if they would be greeted with cheers or bullets, he told his Battalion, "We're going to have a difficult job because some people down there will want to fight us and some won't. If they welcome us, and some authorities say they will, we won't fire a round. If they don't, you have your orders!" From an England airfield, on 7 November 1942 at 1700 hours, LTC Raff received the message that the Peace Plan was in effect. As in all combat situations, the plan changed dramatically while in flight to Algeria. After flying in darkness through stormy weather over Spain, with a strong easterly wind, the formation of aircraft became scattered during the eight hour flight. As the sun creased the horizon over North Africa, the 39 C-47s arrived dispersed, miss-orientated and critically low on fuel. Several planes tried to land at the La Senia airfield as planned, but small arms and ack-ack fire prevented them from landing. At this point, it became obvious that the War Plan was now in effect. As a result of a lack of fuel, several C-47s were forced to land in Sebkra Doran, a dry lake bed. Once on the ground, the planes and paratroopers received small arms fire from the high ground to their north. 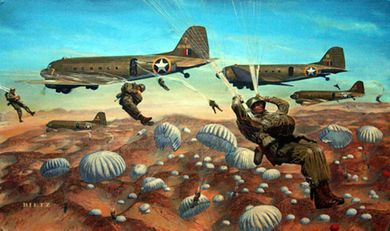 LTC Raff, along with five other C-47s, flew over and observed the consolidation of multiple C-47s parked on the desert floor and paratroopers digging hasty fighting positions among the planes. LTC Raff received a radio message from COL Bentley, the overall Task Force Commander, stating that forces on the ground were under attack by a force of an undetermined size and that an armored force was moving toward their position. Based on low fuel in his C-47, drastic changes on the battlefield causing activation of the War Plan and the approaching armored force, LTC Raff made the decision to jump in order to assist his exposed paratroopers on the desert floor. LTC Raff informed his pilots to locate a drop zone along the high ground over looking the armored advance and where the unit was receiving ground fire. He directed his pilots to radio the remaining five C-47s in order to notify the Jumpmasters to prepare their paratroopers to follow his lead as he exited the aircraft. At approximately 0815 hours on 8 November 1942, LTC Raff, yelled over his shoulder, "Stand In The Door!" to his fellow paratroopers. The jumpers in the rear of the plane moved up until all were lock step behind their commander. As the bell rang, he led the 509th Parachute Infantry into history and validated the new tactical maneuver that we still use today, the vertical envelopment. The 509th would complete their mission and move to the Tafaraoui airfield where they linked up with armored forces moving in from the beach. The 509th would make an additional four combat jumps during World War II, which was more combat jumps than any unit in the Army. Their adaptability and tenacity lives on today in all airborne units throughout the United States Army.